Many people in the United States die each year as a result of electric shock, and most of these fatal injuries occur on the job. 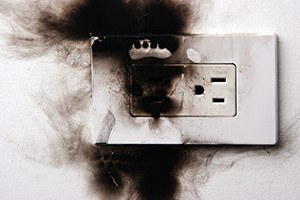 While low voltage electricity may not cause significant injuries, high voltage electricity can result in tissue damage. Serious electric shock enters and leaves the body such that the victim becomes part of an electrical circuit. The dangers of electric shock are present on construction sites, during routine maintenance in an office, in flooded locations near live electrical wires, and near downed power lines. However, electric shock can occur at any job. If you are injured as a result, you should consult the Boston workers’ compensation attorneys at Pulgini & Norton. The severity of electric shock injuries depends not only on the voltage but also on the duration of the exposure and the path by which the electricity travels through the body. Electric shock may result in cardiac arrest, severe burns, respiratory damage, and permanent organ damage. Sometimes the injuries are not visible, but the victim may be left with serious, permanent internal injuries. Workers who suffer serious injuries from electric shock may accumulate substantial medical bills and miss many days of work. They may even become permanently disabled. If you suffer electric shock injuries in the workplace, you should file a claim for workers' compensation. Benefits may include disability benefits, medical bills, loss of function/disfigurement payments, and vocational rehabilitation. Disability benefits are based on your degree of impairment and your average weekly wage. The average weekly wage includes all of your wages in the 52 weeks prior to your injury, including overtime, earnings in a second or third job, certain fringe benefits, and bonuses. In some cases, electric shock results in death. The family of a victim who died of on-the-job injuries may be able to obtain death benefits, which include burial expenses and weekly benefits that are up to two-thirds of the decedent's average weekly wage. You have up to four years after becoming aware of a causal link between your work and your job to file a workers' compensation claim. However, immediately after suffering electric shock, you should seek medical attention. While the injuries may be internal and invisible, they may be serious and disabling. You should also let your employer know in writing about your injury. Notifying your employer is the first step of the workers' compensation process. Your employer is required to notify its workers' compensation insurer, which makes the determination of whether to accept your claim or deny benefits. You should not assume that your employer's insurer has accepted liability if you receive benefits. There is a pay-without-prejudice period during which an insurer may pay benefits while it continues to evaluate your claim. If you are only mildly disabled by electric shock, it is likely that the insurer will accept the claim. However, if you suffer serious injuries, such as organ damage, the insurer may want to take time to evaluate whether the organ damage resulted from job-related electric shock or another cause. If you suffer injuries due to job-related electric shock, you should enlist a Boston workers' compensation lawyer to fight for the full range of benefits to which you may be entitled. At Pulgini & Norton, we can guide you through each step of your workers' compensation claim. Our workplace accident attorneys represent claimants in many Massachusetts communities, including Malden, Lowell, and Braintree. Contact Pulgini & Norton at 781-843-2200 or through our online form to set up a free consultation.